Champa was an ancient kingdom located in what is now Vietnam. 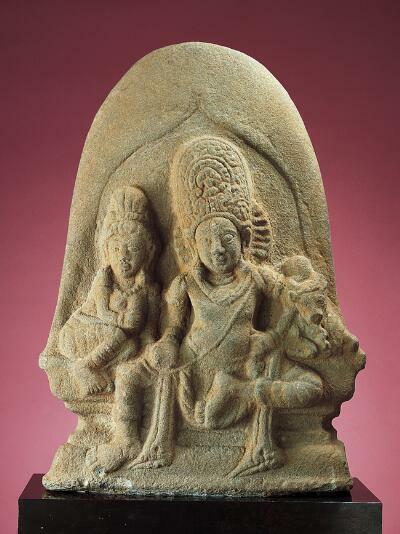 The Cham people practiced both Hinduism and Buddhism. This sculpture represents Shiva with his bull mount, Nandi, and his wife Uma—all of whom are important deities in the Hindu pantheon. An interesting feature is the bell-shaped canopy behind the figures. This likely represents a linga, a phallic emblem associated with Shiva that symbolizes his cosmic energy. An example of a freestanding linga is exhibited across the gallery from this sculpture. This installation of an Indian bull facing two Cambodian Shivalingas, symbols of Shiva, recreates a typical Indian village shrine with a deity below a tree. At temples, too, Shiva’s bull, called Nandi, which means auspicious, is always outside the god’s shrine, facing his sanctum. “Will you not move just a little bit to one side? This bull is interesting for the diverse images and emblems on his body. In his ears sit Shiva’s sons and his wife Parvati. On the animal’s back appears the linga-symbol of his master. Shiva’s snakes twine around his horns… below, they rear up along his foreleg. Parvati is represented by a six-pointed star, along with small figures, some with animal heads, dancing and praying. Next, look at the other side of the bull. (Pause) This flank displays a mystifying array of symbols – including a conch, a turtle and a fish, all aquatic emblems. The diversity of symbols as well as the difference in scale between the bull and the tiny figures on his body seems to emphasize the cosmic nature of this noble animal. In the central part of present-day Vietnam, a highly civilized country called Champa flourished from the end of the 2nd century until the beginning of the 19th. The zenith of the culture lasted from the 8th to the 10th centuries. The Cham people practiced both Hinduism and Buddhism, although Hinduism predominated. A Cham artist carved this charming group sometime in the 10 or 11th century. It represents the Hindu god Shiva, flanked by his wife Uma, and his mount, a bull. The stele behind is shaped like a linga, a non-figural representation of Shiva. Linga means “sign” in Sanskrit. Phallic in appearance, it represents Shiva’s energy and generative powers as well as the cosmic pillar that unites heaven and earth. The shape here also symbolizes Mount Kailash, the mythical abode of the divine couple. In Cham sculpture, Shiva is usually depicted as an ascetic, with a tall matted hairdo, but here he is given an ornate crown. The fact that Uma leans in towards Shiva as if she’s afraid, suggests that this relief may have been placed above a separate pedestal showing the demon Ravana shaking Mount Kailash. According to the legend, Shiva stopped the demon’s destructive actions by putting his big toe on the earth, an act implied here by his right leg hanging down.